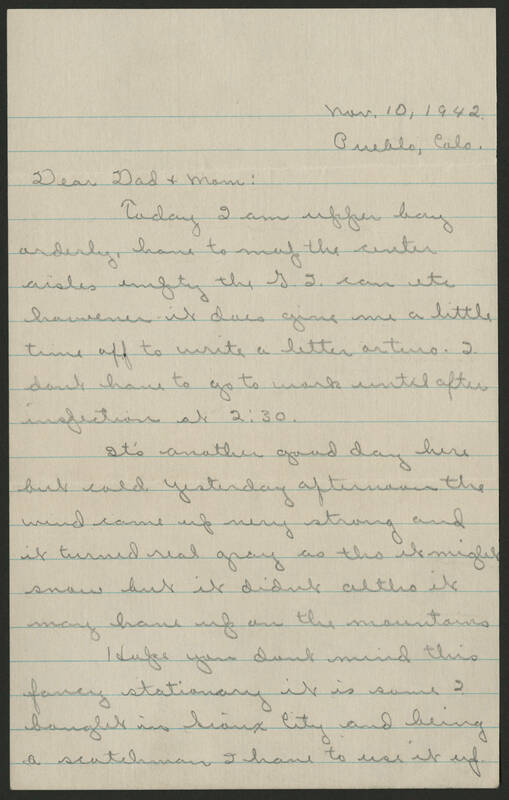 Nov. 10, 1942 Pueblo, Colo. Dear Dad & Mom: Today I am upper bay orderly, have to mop the center aisles empty the G.I. can etc however it does give me a little time off to write a letter or two. I don't have to go to work until after inspection at 2:30. It's another good day here but cold. Yesterday afternoon the wind came up very strong and it turned real gray as tho it might snow but it didn't altho it may have up on the mountains. I hope you don't mind this fancy stationary it is some I bought in Sioux City and being a scotchman I have to use it up.